A few years ago brought news that Alice In Chains was reuniting and releasing a new album. Black Gives Way to Blue was so surprising that I said it was one of the best comeback albums of last decade. The group was a personal favorite of mine throughout high school and I couldn’t be more happy to see their artistic success. But what would happen after spending all that time and emotion and passion and the band moved on past that album? That question is finally answered with The Devil Put Dinosaurs Here. First off, there is a lot of loud, sludgy guitar here that really feels like the self titled album from 1995. This provides immediate authenticity but still manages a bland delivery that is strangely uninspired. On a high level the music is almost a bit forgettable. It’s always been a pet peeve of mine on albums when every single song sounds like a filler track. This makes The Devil Put Dinosaurs Here unimpressive on first listen. Fortunately, the music is not outright bad and, if you like the band, it slowly grows on you. 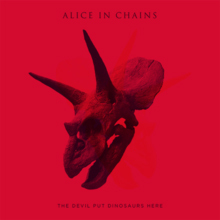 Breaking down the tracks, it is all fairly standard stuff for Alice In Chains, which isn’t to say that it is generic, exactly- there are unorthodox sharp notes, heavy but slow methodical riffs, unexpected tempo changes, harmonized vocals, etc. But with all this, there is a distinct lack of either imagination or effort. The album can’t find a hook or an edge and if I had to guess why I would say that it lacked the emotional drive. After the tour de force of their last album, this is a big let down. DuVall again does a great job at mimicking Layne’s voice but there is not enough focus on his vocals. It is really hard to understand him through the muddy sound; honestly, this might have been done on purpose because the lyrics aren’t that good this time around. Almost every song suffers as a result of this de-emphasis of his voice- none have catchy choruses and the crooning is full of mistimed half-points. Another awful disappointment is the limited dynamic range on the album that makes it difficult to pick out the interesting harmonies and musical accents. The mix results in everything being a heavy mess which might work for some but not me. You know, the physical cd has a cool trick. The cover is printed as shown above but the jewel case is transparent red (similar to how the "tripod" album jewel case was yellow). When you look at the cover through the red case it masks out the red color and emphasizes only the blue. This no doubt is a metaphor for how the devil can be seen in bones above but cd cases can reveal the truth, or something like that- I don’t really understand metaphors. But if I had to try my own, I would say that the music should have been mixed down with blue and red colors but the limited dynamic range, acting as the red jewel case, masks out much of the sound and leaves us with half of what we could have had. I kept listening to this album trying to find a reason to like it more, and honestly, I can appreciate some of the heaviness and repetitive flow more. I can smile at the nuance and interesting bits while accepting that this just isn’t their best foot forward. But all of this rationalization shouldn’t be required for great albums, or even very good ones, and I am admittedly reaching. 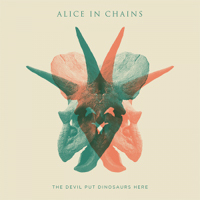 If you still call yourself an Alice In Chains fan in this decade then you should probably pick up The Devil Put Dinosaurs Here, especially if you’re a fan of the old self titled album, but don’t expect any breakthroughs.